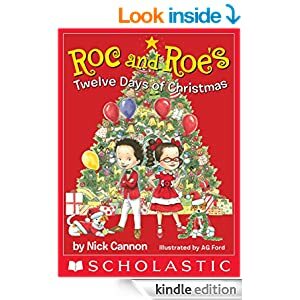 Roc and Roe's Twelve Days of Christmas by Nick Cannon is a rendition of the classic Twelve Days of Christmas. Featured in the book are the twins of Mariah Carey and Nick Cannon. At first I was highly disappointed when I read through this book, as there was nothing new or exciting with this story. Each page tells you of the things they put on the tree. For example, an angel on day one, two Santa's the next. Absolutely nothing else. Then I began to notice the saving grace for this book, the illustrations, they made the book more enjoyable and lively. With with AG Ford's illustrations I could actually see myself reading this story to one of my grandchildren. I could here myself saying, " look at those two, lets see what they are going to do next." I was given a copy of this book by Scholastic in exchange for my honest review. I just wish it could have been a better one.